As we spend more and more of our time staring at the screens of movies, televisions, computers, and handheld devices—'windows' full of moving images, texts, and icons—how the world is framed has become as important as what is in the frame. In The Virtual Window, Anne Friedberg examines the window as metaphor, as architectural component, and as an opening to the dematerialized reality we see on the screen. In De pictura (1435), Leon Battista Alberti famously instructed painters to consider the frame of the painting as an open window. Taking Alberti's metaphor as her starting point, Friedberg tracks shifts in the perspectival paradigm as she gives us histories of the architectural window, developments in glass and transparency, and the emerging apparatuses of photography, cinema, television, and digital imaging. Single-point perspective—Alberti's metaphorical window—has long been challenged by modern painting, modern architecture, and moving-image technologies. And yet, notes Friedberg, for most of the twentieth century the dominant form of the moving image was a single image in a single frame. The fractured modernism exemplified by cubist painting, for example, remained largely confined to experimental, avant-garde work. On the computer screen, however, where multiple 'windows' coexist and overlap, perspective may have met its end. 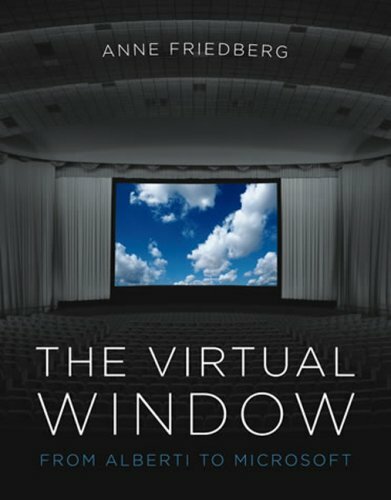 In this wide-ranging book, Friedberg considers such topics as the framed view of the camera obscura, Le Corbusier's mandates for the architectural window, Eisenstein's opinions on the shape of the movie screen, and the multiple images and nested windows commonly displayed on screens today. The Virtual Window proposes a new logic of visuality, framed and virtual: an architecture not only of space but of time.